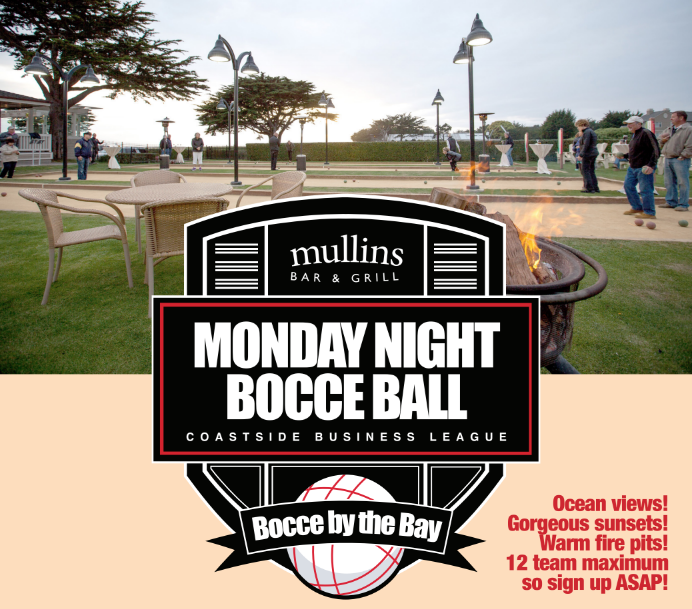 Join the Spring bocce league specifically for Coastside businesses! Grab some staff members to represent your business on the Coastside and get rolling! The Chamber of Commerce and the Half Moon Bay Review will both have teams. When:8 week season starts April 8. Ends May 20. 6-8 p.m.
Includes:Opening and closing night dinner, 8 weeks of organized bocce with facilitator AND tons of prizes! Get your name on the trophy! Needed:4 players per night (can rotate or keep the same). We encourage you to fill the team with your staff members to represent your business but spouses and friends are great too. They will be representing your business! There will be 2 games per team per night. You can play with as little as two people, but its best with four. You can bring more staff members if you like during the season, but the opening and closing dinners will be for four business representatives. More can join the opening and closing dinner and just order off the menu if they’d like dinner. Our facilitator will help with all the rules and scoring. You just gotta enjoy rolling!